When my mom was young she went to day camp where they had an activity called “riflery”. The kids would get down on their bellies and shoot at targets, and that was New York state. Mom will even, remind us, now and then, that she was “a pretty good shot”. So why, as a strong woman, with her grown daughter as her guide, did my mother bail on me at the range after a few shots with a .22 lr target pistol? She said it made her too nervous and she would have preferred to shoot from the ground. (Among other reasons.) I am hoping that she will give me, and shooting, another chance. It took me a while, but I am beginning to understand that, to some, rifles are the entry point. 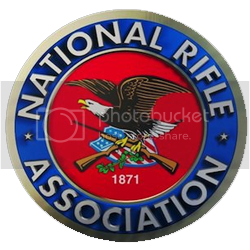 One reason for this could be that rifles deal with targets at a greater distance than do pistols. This gives the shooter a more secure feeling and less of a sense of an impending threat. Also, the body has three contact points with the firearm, allowing the shooter to feel more connected and in-control of the gun. 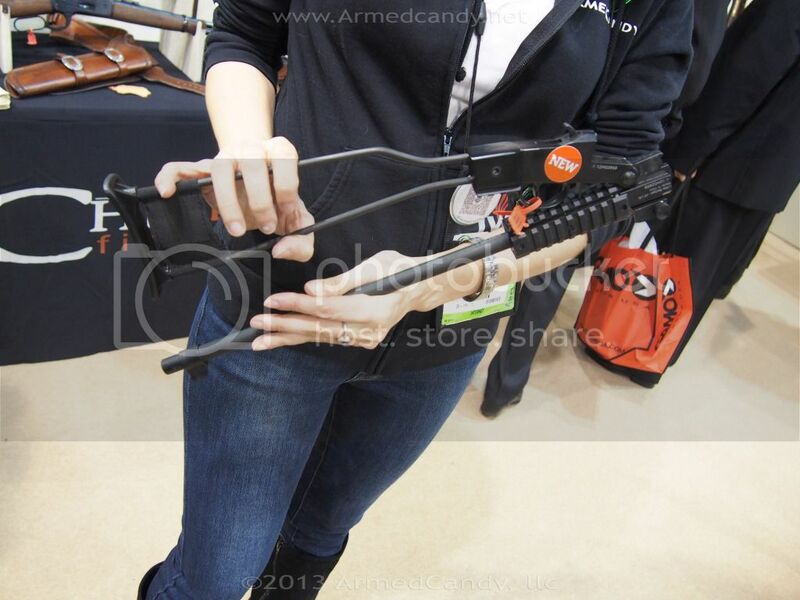 One firearm on display at SHOTShow made me think that, with it, I might be able to get my mother to try again. 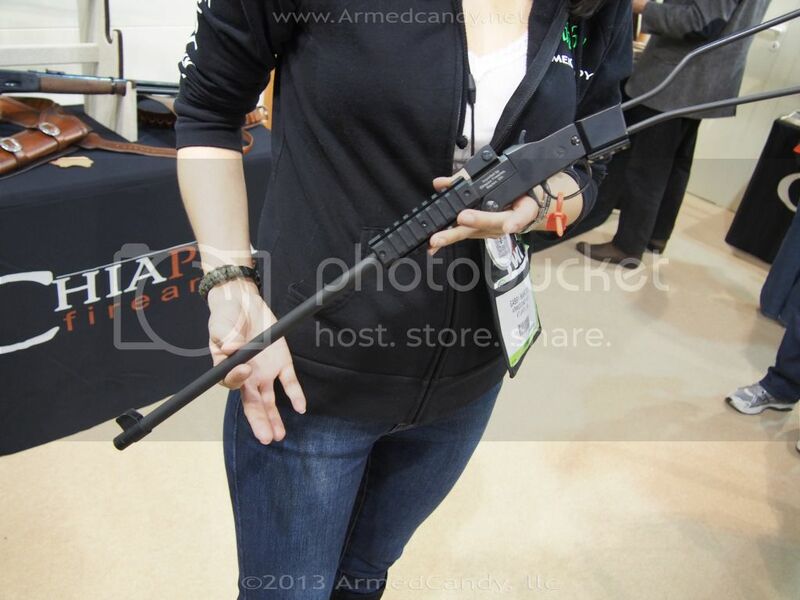 This was Chiappa’s Little Badger “Survival Rifle”. This tiny, folding, .22 lr is the bare-minimum and is still a solidly built machine. It may also be marketed as a junior rifle, though I imagine that could be part of it’s appeal for new shooters. I genuinely liked the feel and the sights, and I also felt that the small strips of picatiny rail would appeal to all who enjoy a little customization. The wire stock is surprisingly comfortable and will come with a plastic ammo storage system that will easily snap on and off. If I had a VERY well-stocked go bag, I think this gun would be in it. Heck, I could see this gun hanging out in the trunk of my car for impromptu camping trips. I was told that the price point would be less than $200, maybe even a number closer to $150, and for that price, I can’t see any reason not to own this gun! Hopefully your mom will give you another chance in the future. I wish my parents would! My dad tried to get me into shooting when I was a kid but I was never interested. Now that I am, it seems HE isn't. Regardless though, for $150 you're absolutely right, there is no reason NOT to own that gun. Pretty neat little rifle.